I’m not a great one for political correctness. In my view, the tinkering that has gone on recently with the names of the great eras of art is one of the least helpful of all the correctives pushed through by the PC police. Last year, I got into trouble on TV for calling the series I was making The Dark Ages. You’re not allowed to call it that any more, wrote in a gang of professors. The years after the late antique era are now known as the early medieval period. The Renaissance is no longer the Renaissance either. These days, you’re supposed to call it the “early modern era”. But there is one artistic epoch which, I agree, is in sore need of a name change, because the label it usually goes by is so misrepresentative and grim. I’m all for epoch names with a flavour, but the trouble with “prehistoric era” is that it has too much flavour. It tastes too strongly of warts and hairiness, of sharp teeth and low foreheads. I bridle also at the privileging that always takes place on these shores of things that are written down. The ridiculous notion that some sort of giant cultural portcullis separates mankind’s time on Earth into an era when there was no history, and an era when there was, needs to be elbowed out of our thinking. In fact, this so-called prehistoric era has left behind something better than a written account — something more exciting, more visceral, more educative. Prehistory has left behind lots of art. A selection of this exciting evidence is now heading for the British Museum, where a show devoted to art from the last ice age is set to open. Its span is suitably mammoth — from about 40,000 years ago to about 10,000 ago. That’s 30,000 years of prime human creativity handily précised and framed. It’s a mouthwatering prospect, and also a rare one. I can’t remember any previous exhibitions covering this fascinating creative splurge. One reason for the shortage has been the ingrained cultural prejudice of the civilisation snobs. There’s a view afoot, isn’t there, that being cultured requires turning up after the Greeks. But this show is going to prove that long before there were Greeks, or books, or plays, there was art. And early humanity didn’t merely admire this first art: it depended on it for its survival. You may not know this, because you’ve never had cause to visit them, but the galleries at the back of the Natural History Museum in Vienna have an Indiana Jones atmosphere to them. These are spaces in which the spider feels at home: dusty and old fashioned, fusty and dimly lit. I love them, and don’t mind at all that seeing anything properly in this creaky twilight requires superhero vision. You may not see the art clearly at Vienna’s Natural History Museum, but you certainly feel its mystery and its heft. 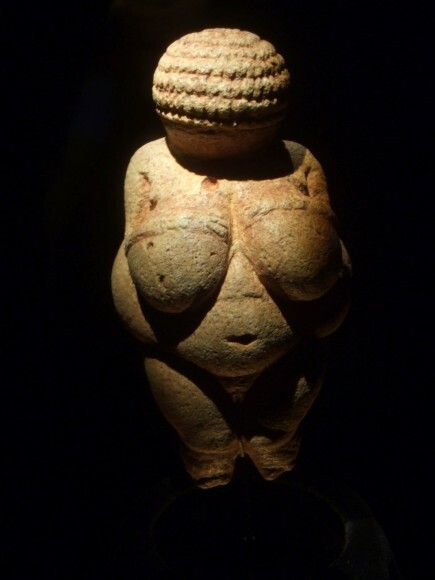 This was the context for my first and only face-to-face encounter with the Mona Lisa of the ice age, or, as she’s usually called, the Willendorf Venus. She’s the most famous and precious of all examples of prehistoric sculpture. They only take her out of her box on special occasions, and to organise one of those occasions requires the filling in of many forms, the making of many phone calls, the pulling of many strings. But it’s worth it. First, they sit you down in a dark corner at the back of the museum, and lay out a special table for you. Then, they force you to wait, thumbs a-twiddling, for an hour. Eventually, the click-clack of some hard Austrian heels echoing through the cobwebby spaces becomes audible in the distance. Venus is approaching. Click, clack, click, clack. When they finally serve her up at your table, in a lovely old wooden box, handmade for carrying her, it is with the air of careful ceremony that you get when you sample the tasting menu in a Heston Blumenthal restaurant. Everything about the process seems to emphasise the Venus’s specialness. Until they actually open the box, and reveal the dumpy little fat lady inside. Haven’t we all bought sausages from someone just like her at Shepherd’s Bush Market? When I say she’s fat, I mean cuddly. Very cuddly. In photographs, the Willendorf Venus looks wildly overweight, but in the flesh, the most noticeable thing about her is the soft and welcoming motherliness of her presence. Look at those fabulous DD breasts. That gorgeously embedded belly button. The sweet cleft of her oopsie. She’s actually tiny, no taller than a small cigar. As soon as I spotted her, my hands started twitching with the desire to cup and cradle her. She’s so gorgeously diddy. Of course, the museum won’t actually let you touch her. At 24,000 years old, she’s far too ancient to stroke. But they will turn her around, and from the back, the sense of extra-strong motherliness that emanates like powerful gamma rays from the Venus of Willendorf seems even stronger. I’ve seen buttocks like hers before. I see them every day. They’re usually wearing something stretchy from Marks and Sparks, and wandering among the supermarket shelves buying that night’s dinner. Twenty-thousand years ago, in the so-called prehistoric age, a brilliant central-European artist found a gorgeous sculptural form for the everyday experience of motherhood. Unfortunately, the Venus of Willendorf will not actually be coming to the British Museum. She’s too fragile and precious. But a selection of her handmaidens will be making the journey. So far, about 140 of these prehistoric Venuses have been dug up, scattered about distant corners of Europe. Remarkably, whether they come from the hot south of France or the cold north of Russia, they tend to share the same physique. And with their pendulous breasts and motherly bottoms, all the Venuses of prehistory seem to be making a stand against the slim-hipped and boyish girlies preferred by the modern world. Why do they all look so similar? Why are there so many of them? What were they for? Art historians, being art historians, are scared of speculating. But my dumb old hands could sense that the Willendorf Venus was made for holding as soon as they saw her. That’s why she hasn’t got any feet. We also know she was portable because the stone from which she was carved came from a valley far away from where she was found. So my guess is that all these pendulous Venuses were portable talismans, carried around the prehistoric world to ensure the arrival of babies. This first human carving supplies magnificent evidence of the power and importance of art. It’s not only me who thinks this. The British Museum will be pointing out what a huge influence this exciting harem of bulging Venuses had on the pioneers of modern art — Matisse, Picasso, Henry Moore. Picasso owned two casts of the famous Venus of Lespugue, the most cubistic of all the paleolithic Venuses. He kept her in a small cabinet of curiosities in his studio, and consulted her endlessly on the crucial sculptural subject of blobbiness. As for Henry Moore, his entire career can be viewed as an updating of prehistoric values. Of course, another reason why exhibitions of prehistoric art are rare is because so much of it is inaccessible. I’m not talking here about the bureaucratic hoops you need to jump through, I’m talking about the yomping. Most prehistoric art is ridiculously hard to see. Some of it because it is so small; some of it because it is so heavily policed and out of bounds; the rest because it is attached to the walls of dark caves hundreds of feet underground. That’s why I am so jealous of Werner Herzog, the German film director, who managed somehow to get himself and his film-crew into Chauvet cave, the finest known underground gallery of cave art. Herzog had to go all the way up to the French ministry of culture to get his permissions. It turned out the minister liked his films. I tried the same route, and got slapped with a conclusive non several rungs down the ladder. Since Chauvet was discovered in 1994, only a handful of modern visitors have been allowed in. If you haven’t seen Herzog’s 2010 film, Cave of Forgotten Dreams, I recommend you do. It was shot in 3D, which allows you to see how purposefully the paintings of rhinoceroses and antelope were positioned in the hollows and crevices of Chauvet. The caves weren’t just the background for the amazingly eloquent representations of animals — they were the inspiration too. Much is made nowadays of the accuracy of prehistoric art, and the skill with which the first artists depicted the animals that roamed their world. One of the finest objects in the British Museum show is a mammoth tusk carved 13,000 years ago with an image of two reindeer swimming across a river. Everything in the carving is perfectly observed. This is an artist who knew exactly how reindeer moved. Only the other month, university researchers working in Hungary announced that they had compared artistic representations of animal movement from different periods and found those from the ice age to be the most accurate. It wasn’t until the 18th century that the movement of a horse was understood as well as it had been in prehistoric times. This announcement rightly drew attention to the skills of ice-age artists. But what it forgot to mention, or chose to ignore, was the remarkable fact that what these artists were drawing so accurately was being imagined, not seen. There were no herds of reindeer stampeding through Chauvet cave, hundreds of feet below the ground. No underground rhinoceroses. No subterranean lions. All the great imagery on the cave walls was pouring out of the artists’ heads. Although they would not let me into Chauvet, I have managed to talk my way into other important cave sites and every visit left me with the same question: why? Why would anyone struggle miles underground, deep into the darkest unknown, with just a flickering torch, in order to paint some pictures of bison on a cave wall? It made no sense. Getting down there is hard enough today. Twenty thousand years ago it must have been unimaginably difficult. Yet all these intrepid artists, in all these different corners of the world, chose recurrently to do it. What powerful trans-geographic imperative were they following? I finally found an answer in Africa. Which is fitting because that is where we all come from, and where all our art must also have begun. In 1997 I was making a television series called, portentously, The Truth about Art, and one of its subjects was the art produced in southern Africa by the San people, known in those days as the Bushmen. The San, who still survive today in the Kalahari, were significant because their art had hardly changed in 20,000 years. They were a living link with the past. The greatest masterpiece of San art is a spectacular cavern in Zimbabwe called Inanke Cave. It’s located high up in the Matobo Hills, not far from Bulawayo. Getting there with a film crew was a nightmare. It’s such an arduous trek. Today, a few stone heavier and a couple of decades older, I doubt I could make it. They call Inanke the Sistine Chapel of rock art, a name it certainly deserves. At its centre is a 30ft-long frieze of surging, scampering, stomping animals — eland, giraffe, kudu — all painted with exquisite precision on a domed cave roof. The moment you see the Inanke frieze you sense its unshakable kinship with the cave animals of Chauvet or Lascaux. In San culture the shamans make the art. They choose to do it in remote locations because these are the places in which their handiwork can be most effective. The deeper you go into the cave, the higher up the mountain you climb, the closer you get to the dreamworld beyond. To understand why, put yourself back in time for a moment, 20,000 years or so, to a world where nothing is explained. How would you understand images that pop into your head when you fall asleep? Where would you think you’ve been when you woke up from a dream? The professors studying the San watched their shamans taking hallucinogenic drugs in order to re-enter the dream world, which they understood as a parallel dimension in which all of life’s most important events were controlled — birth, death, rainfall, the success of the hunt. The cave walls were the “veil” that separated this dream world from the everyday world. The only people who could pass through the veil with their art, and effect changes in the world beyond, were the shamans. Thus, for the San, art had the power of life and death. As chance would have it, I witnessed a couple of shamans in action at Christmas. Not in Africa, but Mexico, where I’d fetched up on the day the world was meant to end, according to a dotty misreading of the Mayan calendar. It was nonsense, but plenty of people believed it. Outside the entrance to the beachside Mayan ruins of Tulum, a gaggle of modern Mexican shamans had gathered to pose for photographs and dance along to the end of days. One seemed familiar. He had some kind of mocked-up jaguar skin on his head, a skimpy loin cloth, and nothing else. Where had I seen him before? It wasn’t till I got back to London and opened up my big bag of press releases for 2013 that I saw him again. My Mexican shaman was a dead ringer for the so-called Lion Man, one of the most beautiful and mysterious carvings included in the British Museum show. With the head of a wild cat and the body of man, the Lion Man has been puzzling the professors since they found him in a cave in the Swabian Alps in 1939. He is calculated to be 32,000 years old. Which must surely make him the oldest portrait of an artist in the world.